I came across a series of photos from photographer David J. Phillip, showing the devastation to Gilchrist, Texas from a helicopter tour. From the air, you can really see the impact; with the Gulf of Mexico seen at right, one beachfront home stands among the debris. Ike was the first major storm to directly hit a major U.S. metro area since Hurricane Katrina devastated New Orleans in 2005. I want to see an interview with the owner of the only house standing. Is it really in as good of shape as it appears? I appologize for my recent comment that was edited out due to a lack of understanding on my part!! I feel for the people who lost everything in the Texas coastal areas! I have found through research (should have done this first before acting stupid), that the before shot was from months ago and the now photo was just after the hurricane! I am extremely sorry for being judgemental and assuming the photos were doctored! I will be sending a donation of goods and money to the red cross and i sincerely hope and pray that the people that were effected by this will find peace and know that many people will say mean things but know that they are ignorant and may never have been personally or directly effected in their lives in such a way as you!! It's so hard to look at these photos and seeing what news coverage there has beein on Bolivar, Crystal Beach, Gilchrist, and High Island. I moved to Crystal Beach when I was in 5th grade and graduated from High Island in 1985. I've been in the military for over 20 years and have seen a lot of devastation and destruction. I look at all this and it seems so unreal. I am living in Germany right now and have been searching on the internet for all the info I can get. What I've found is so unrecognizable. I've seen sattelite photos of my home and where I grew up and you can't see anything familiar. Our "stomping grounds" are gone. Nothing is left and I'll be surprised if they put any money back into it. That's sad because it was a great place to grow up and many families spend their summers there. I leave here in December and will definitely go down there and try to find old friends and see what I can do for them. Is this the only home that lasted through the storm, and if so was this a new built home or one that has been there for awhile. My prayers are with everyone that has been impacted by Ike. Unbelievable devastation, I was stunned to view the before and after pictures. My thoughts and prayers are with all persons affected by Ike. Please keep up the reporting on The Bolivar Peninsula (Crystal Beach, Gilcrest, etc.) and Orange County. 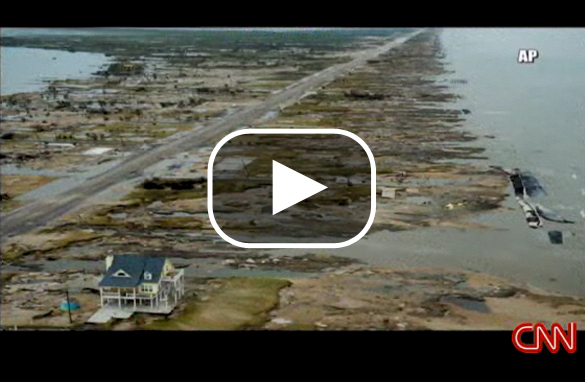 CNN has had the only coverage on these two areas which appear to be the most hard hit by Hurricane Ike. I am from Beaumont and have family who own homes in both areas and we all would like to know more. Keep up the great work! for a full recovery . I agree, it is very sad. What is also sad is that year after year we continue to pour billions into rebuilding coastal towns and cities. When are we going to wise up and have federal laws forbidding residential building this close to the shores? If they want federal assistance, they should be rebuilt far enough inland so that this does not continue to happen. If hotels and commercial tourism companies want to build close to the shore for tourists, fine, but they should be on their own financially if disaster strikes. Our family had a beach cabin in Gilchrist on Van Zant St which runs across the peninsula from the north end at the East Galveston Bay to the south ending at Hwy 87 just about 100 yards from the Gulf of Mexico. The cabin was built in 1959. My late grandfather and his coworkers were on strike from the local Gulf refinery so he called in all his favors and built the beach cabin. The cabin was a home away from home for my father, aunt and uncles then me, my siblings and cousins for our entire lives. Some of my most vivid childhood memories happened at the beach cabin. My grandmother and grandfather have both passed away in the past five years and that cabin became my families’ last physical link to them. While I morn for those who have lost family members in the hurricane I also morn that I will never again be able to visit that cabin and feel the presence of my grandparents. I would like to comment on the LACK of coverage from CNN during this crisis we are going through down here in Houston. It seems that people on the LEFT are not that concerned with a RED. This is just another reason why myself and everyone i know does not watch CNN. To many LEFT winged topics that are a waste of peoples time. Keep the good work AC! I have family living in Houston and very worried about them. After watching the news this afternoon, I couldn't believe my ears!! Residents waiting in lines 4 miles long for food and water which should have been there long before the lines reached that length. What in the world is going on with FEMA and our federal government when we can't provide necessary food and water after such a disaster? When will they get it right??? Instead of spending money on crap this country doesn't need (war in Iraq) and sending money to other countries why are we not taking care of our own first? I will be glad to see George Bush leave the presidency. He has caused American families far too much suffering. I am very saddened at whats become of our beloved Crystal Beach. I was 13 years old, in 1988, when my parents purchased our beach cabin. It wasn't much of a cabin, a fixer upper you could say. The year before my dad retired in 2001, he gutted the cabin and my parents and I worked at creating a beautiful beach home. It was the perfect place to go. We called the beach "The Gathering Place". It's where their beach friends gathered on the weekend to visit and have fun. I know our beach is no Cabo, Cozumel or Fancy Beach resort, but it was our home away from home. An hours drive from the everyday stress of work, school and family. It was the most relaxing place to get away. My dad has spent the last two years working on the outside of what was his dream for the cabin to look like. He had an artist paint a beautiful mural on the side of our cabin of paradise. We have yet to see any arial shots of our cabin. Our cabin was about a 7 minute drive from the Bolivar Peninsula. Our cabin survived Hurricane Rita, and we just knew we would be coming home to it again soon. Little did we know the power of a category 2 storm could cause so much destruction and destroy Crystal Beach. I pray for all the ones that were lost. I pray for all of the families who have lost their primary home and their secondary homes. I will miss our gathering place, and what it represented. It was more than a beach, it was a place that brought so many strangers together, that we now call family. Though our beach cabin is gone, I will always keep the 20 years of memories with me. Thank you to CNN for going into Southeast Texas and giving us a glimpse of the damage. To everyone heading home this week, be safe. This is the beach I spent my summers at as a teenager in TX. In fact, last Thanksgiving was spent right here. Devastating to say the least. Pray for the survivors. It's a stunning picture.... of devastation & resoluteness. Hope everyone living in the area got away safely. BTW, the company that built the white house really has a bright future in construction! struck. This is considered Ground Zero...not Galveston, not Houston. but what where Ike really hit.....The Bolivar Peninsula. We need the media to help us, too. This town reminds me of Waveland, Ms and Lakeshore. I live in Gulfport, MS and run a small ministry we stayed out in the towns for over a year helping those in need. It blessed me and those with me as much as it blessed those we helped. I ask those that can help these people to reach out and help. If one person reachs out to help just a little, it means so much. It takes us all working together to help those rebuild. I remember Anderson Cooper coming here. He did some great programs for our area showing others around the world what had happened. So much media was on New Orleans at the time. Thank you Anderson for helping us. This little town will continue to need help for a while. Don't forget to continue your stories about them. My heart goes out to them. We must all remember it not's not our possessions that make us happy, it is reaching out to help others that fulfills our purpose in life. Did whole of residences evacuate? It looks just as same as weather reporter's computer prediction of flooding. But houses are gone. Does Government help them for... everything? This side by side comparison is sad. best hopes for you all.